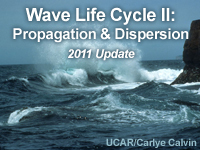 The goal of the lesson is to enable a marine forecaster to manually predict how the wave height and period will change as the waves leave their generation area, become swell, and then propagate and disperse into the forecaster’s offshore coastal waters. While numerical wave prediction models can provide swell height and period forecasts, they are dependent on accurate wind forecasts by atmospheric prediction models. Therefore, manual skills in determining swell height and period are needed in order to cross-check or correct model predictions in cases of poor or unresolved model forecasts of winds. The lesson starts by discussing how swell propagate along great circle tracks and how these tracks will look different on various map projections. With this in mind the concept of developing a known “swell window” for a given location is introduced. Next, the lesson uses conceptual animations to demonstrate the effects of dispersion on the swell group as it propagates over a long distance. Also discussed are nonlinear processes, wave steepness, travel time, event duration, and opposing winds. Then the lesson explains how swell height changes due to angular spreading of wave energy and provides a simplified method to calculate this change. Finally, users are able to test their new understanding of these concepts through a short exercise where they are asked to determine swell height and period at multiple locations. User interactions are included throughout the lesson and within the short exercise. This is the third in a series of training lessons on marine wind and waves. It follows the “Wave Types and Characteristics” and “Wave Generation” lessons. Although this can be useful, the person narrating the content was monotone at times and I got lost trying to listen and understand. Also some of the questions on the quiz could have reflected more on what she was talking about in the videos.The nomograms need to be more accurate or larger in picture, so I can get at least relatively close to the answer. I found myself squinting. Along with some of the nomograms, there could have been more examples and a better explanations. Seemed confusing at times. Maybe I just need more practice. More visuals may help. Nice explained not whistanding the dificulties, and perfect for study ad home on your own. State the difference between seas and swell. Recognize that waves propagate along great circle tracks and that these tracks look different on various 2-dimensional map projections. Consider the effects of diffraction around barriers in forecasting swell heights. Explain how significant swell period can lengthen over time due to nonlinear interactions and dispersion, while individual swell period is conserved. Given initial swell period, propagation distance, and fetch width, use a nomogram to forecast the change in significant swell period due to dispersion of a wave group. Given initial or final swell period, propagation distance, and fetch width, use a swell travel time chart to forecast the time a swell to begin to impact a destination. Using a swell travel time chart, forecast the length of time a wave group will affect a coastal area. Given significant wave height for waves propagating in the central direction of a fetch area, forecast the decrease in significant wave height due to angular spreading for locations up to 70 degrees off the central direction of the wave group. June 2016: HTML framework updated to latest cross-browser compatibility standards. October, 2011: This module has been updated to provide greater flexibility in navigation and linking to specific content. In addition, minor changes have been made to improve the clarity of the content and correct inconsistencies. However, these changes do not affect the overall substance of the material taught.